Welcome back to another week's worth of ideas for dinner to feed your family. Each week, I share our family meal plan with you. 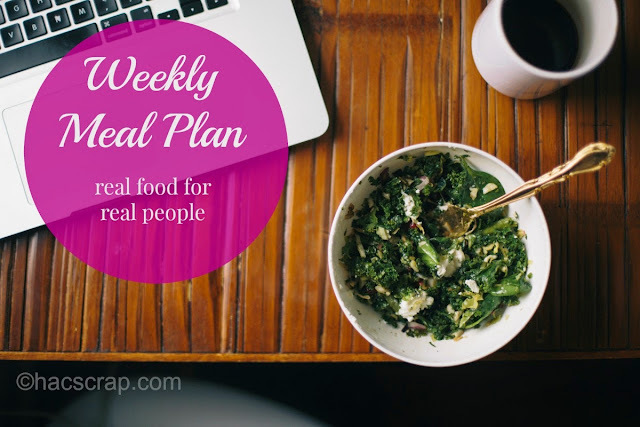 Some weeks it is heavy on faster meals and easy dinners, but it's almost always real food, that will satisfy your family (even picky eaters - since I have one too). I am not a short order cook, but if the kids are not a fan of the main ingredient or some part of what is prepared, they have some options, from what is already available with little additional prep. It works for us. It may or may not work for you, but going into the week with a plan, gives you "wiggle room". Having my plan and my ingredients on-hand, allows me the freedom to switch stuff up if I need to or put something off until next week if our schedule changes. This post is linked up at I'm An Organizing Junkie. 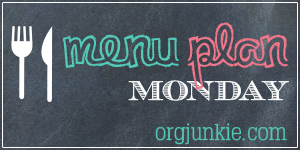 Check it out for additional meal planning ideas and inspiration. Your menu looks delicious, especially the BLT's I haven't had one outhouse in ages! I totally need to start meal planning. I'm currently pondering what we'll eat after Gabe's baseball game.